Maximum exposure can be delivered across the whole of the body of a promotional ballpen with these Full Colour Printed Pens! 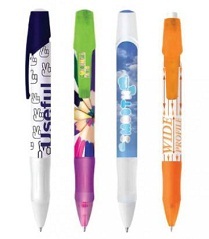 This pen is massively customisable with personalised clip, grip, plug and section - 20 colour choice!! Choose a huge array of practically any colour you choose and have these colours on either opaque or frosted. The word 'custom' doesn't do this pen justice! Filled with either black or blue inserts, depending on your choice of order, this ballpen will be suitable for any documental type of writing. Add a little colour to your brand name and logo with a 76.6 x 43.6mm print area! Excellent Price to Performance Ratio! For a FREE QUOTE, please fill in the form regarding our Full Colour Printed Pens and we'll be able to help you.